AA lithium bulk batteries are lightweight, compact, versatile and have at least a ten year shelf life. Medic Batteries offers a convenient lithium AA 8 pack of batteries with FREE SHIPPING. Our batteries are shipped from our temperature-controlled warehouse and are 100% guaranteed to be fresh lithium AA batteries. FREE SHIPPING on AA lithium bulk batteries is just icing on the cake. 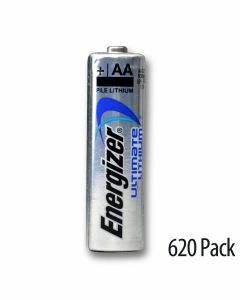 An Energizer lithium AA 8 pack of batteries is 33% lighter than their alkaline counterparts. Energizer AA lithium bulk batteries are fresh and highly dependable, delivering long-lasting power. So, if you want more bang for your buck, purchase Medic Batteries’ AA lithium bulk batteries. AA lithium batteries offer reliable, long-lasting power. Medic Batteries offers unbeatable prices and free shiping—why buy AA lithium bulk batteries anywhere else?